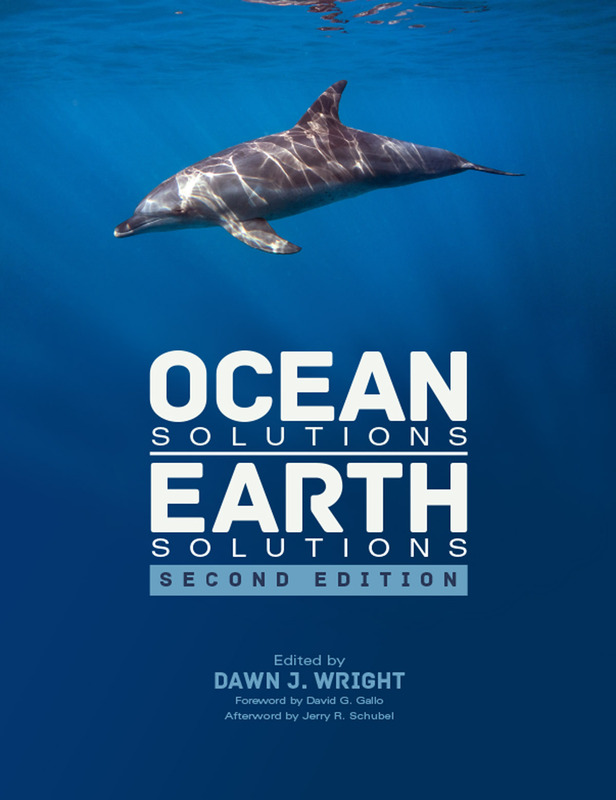 Redlands, California— The second edition of Ocean Solutions, Earth Solutions, published by Esri, takes a deep dive into the science of protecting oceans and coastlines, with a special emphasis on the role that geographic information system (GIS) technology plays in this quest. Oceanographer and Esri chief scientist Dawn J. Wright, the book's editor, has collected papers submitted to the annual Esri Ocean GIS Forum and transformed them into a fascinating book for scientists that shows how GIS and other technologies serve as valuable tools for ocean science. More than 90 professionals and academics in fields such as oceanography, marine science, marine conservation, environmental science, coastal engineering, and marine resource management contributed to the book. The result: 23 chapters that detail important research done using GIS to study, manage, and protect the oceans, coastal habitats, and marine life such as fish, whales, and sea turtles. "Our ability to measure change in the ocean is increasing not only because of improved measuring devices and scientific techniques but also because new GIS technology aids us in better understanding this dynamic environment," says Wright. The book includes a wide variety of examples of how GIS is being used in ocean science, coastal management, and marine life protection. One chapter is devoted to the development of Whale mAPP, an app that can be used on mobile devices or the web to record and map sightings of mammals such as whales, seals, and dolphins. Researchers or citizen scientists can also use the app to describe the mammals' behavior and collect other data such as weather conditions and photos. Another chapter describes the web-based Coastal Defense app, developed by Nature Conservancy and its partners. The app helps users identify areas at risk for coastal erosion and find nature-based solutions, such as using oyster reefs or mangroves to reduce the impact of waves on coastlines. Ocean Solutions, Earth Solutions was dedicated to the late Peter Kouwenhoven, who cowrote chapter five, "How Does Climate Change Effect Our Ocean?" He and his coauthors used spatial analysis tools in GIS technology to map data that illustrates changes in ocean acidification, nitrification, and sea surface temperatures. Analyzing future sea level rise. Studying changes in island morphology and biodiversity on Tetiaroa, an atoll owned by the Brando Estate and located in French Polynesia. Analyzing, visualizing, tracking, and managing energy-related data for the US Navy with the goal of reducing energy consumption. Visualizing ocean information that incorporates time and complex data. Jerry R. Schubel, president and CEO of the Aquarium of the Pacific in Long Beach, California, says that, going forward, tools like GIS are vital in the fight to save one of earth's most valuable resources: our oceans and the marine plants and animals that live there. "Even at the present levels of human activity, we are degrading marine habitats and ecosystems—and losing marine life—at an alarming rate," Schubel wrote in the afterword of Ocean Solutions, Earth Solutions. He added that turning things around for the better will depend on marine spatial planning and the use of geospatial tools such as GIS. "This book provides numerous examples of what GIS can do and, more important, how to go about doing it," he wrote. The audience for this book includes professionals in oceanography and marine science and research, as well as students in those fields. Readers of both the print and e-book versions have access to an extensive digital supplement with datasets, geoprocessing workflows, GIS tools, mobile apps, story maps based on Esri Story Map apps, and Python scripts. Ocean Solutions, Earth Solutions also uses digital object identifiers (DOIs) for citation of both the book and supplementary datasets. DOIs are useful for research and global library cataloging purposes. 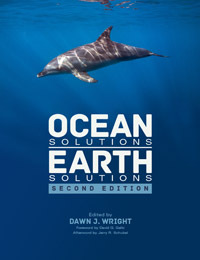 Ocean Solutions, Earth Solutions is now available as an e-book (ISBN: 9781589484658, 512 pages, US$39.99) and will be released in print in late June 2016 (ISBN: 9781589484603, US$59.99). The book can be obtained from online retailers worldwide, at esri.com/esripress, or by calling 1-800-447-9778. Outside the United States, visit esri.com/esripressorders for complete ordering options, or visit esri.com/distributors to contact your local Esri distributor. Interested retailers can contact Esri Press book distributor Ingram Publisher Services.